The church building is accessible to all levels. 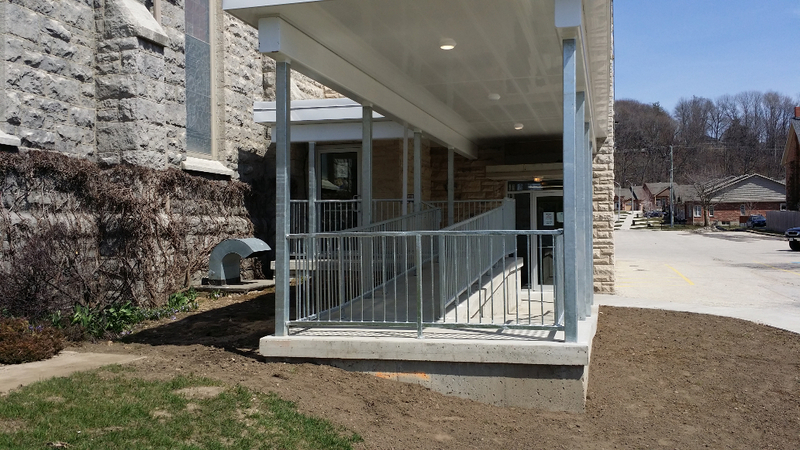 Lift – there is a lift on the north side of the building which allows accessibility to the auditorium and the sanctuary. The 10th Street door is open on Sunday morning. To access the sanctuary via the auditorium and ramp, exit the lift on “Auditorium Level”. All levels are accessible using the lift. Ramp – the ramp is located on the south side (driveway) of the church and leads into the sanctuary or the auditorium. The ramp door is open on Sunday morning as well as during normal office hours. The ramp is covered. In 2016, the updated ramp was installed. Accessible Washroom – located off the north end of the auditorium. Hearing Devices – are available from the Sound Technician. Large Print Bulletins – duo-tangs with the service, hymns and announcements included, are available at each of the entrances.